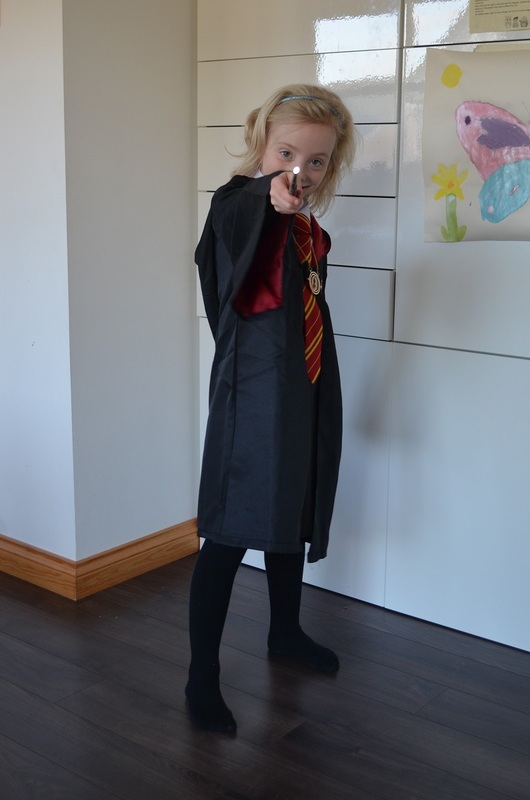 This is the last of 3 posts describing how we threw a really easy, quick and cheap Harry Potter-themed party for Mini Minx’s 7th birthday. I’ve already told you about how we prepared for the party and what activities and games we did during the party. 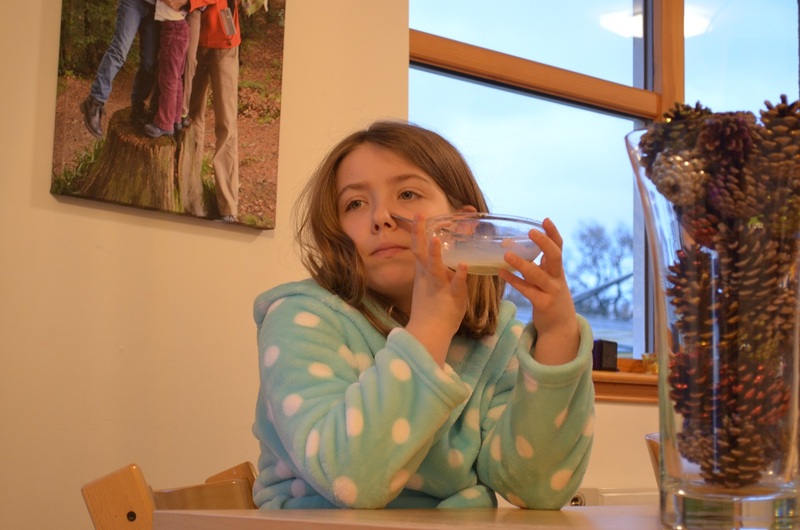 This post describes my favourite bit – the food! Again, to give it a bit of context: this amount of food was for 10 little girls aged around 6 years old. It was just right – there were some leftovers, but not much. Birthday Tea – Usual Party Food. We made up the usual plates of food (and I’ll detail them below in case this is the first birthday party you’ve thrown and you’re not sure about amounts!) 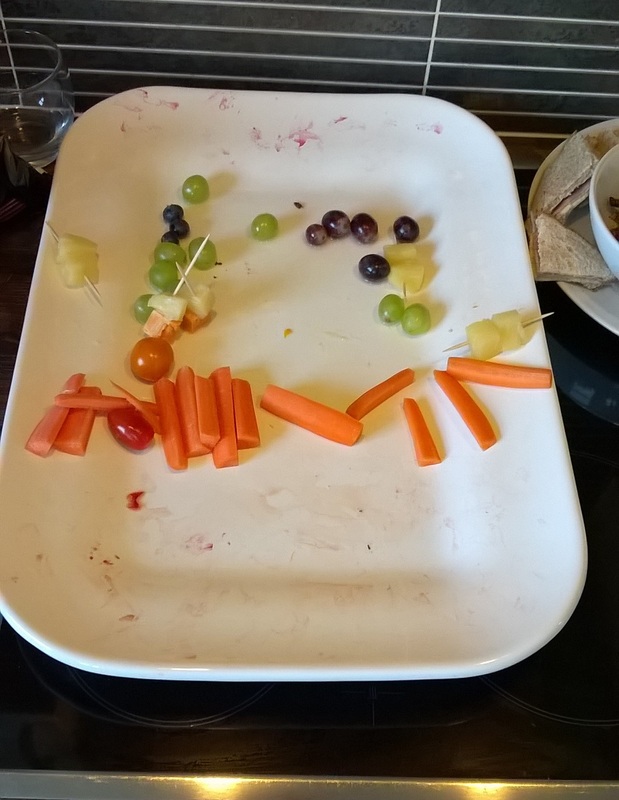 Another ‘usual’ that we did was a Rainbow Plate. Rainbow Plates have been a staple at Family Trout birthdays and all parties since the very first one. I initially made one up because I thought it would look pretty and would appeal to kids who actually like fruit and veg. It’s now appeared at around 20 birthdays since, and is always the first plate of food to be finished entirely. I think that’s enough anecdata to make the case that it’s as essential to the Birthday Party Table as the Birthday Cake itself. All that was left. I think the girls enjoyed it! 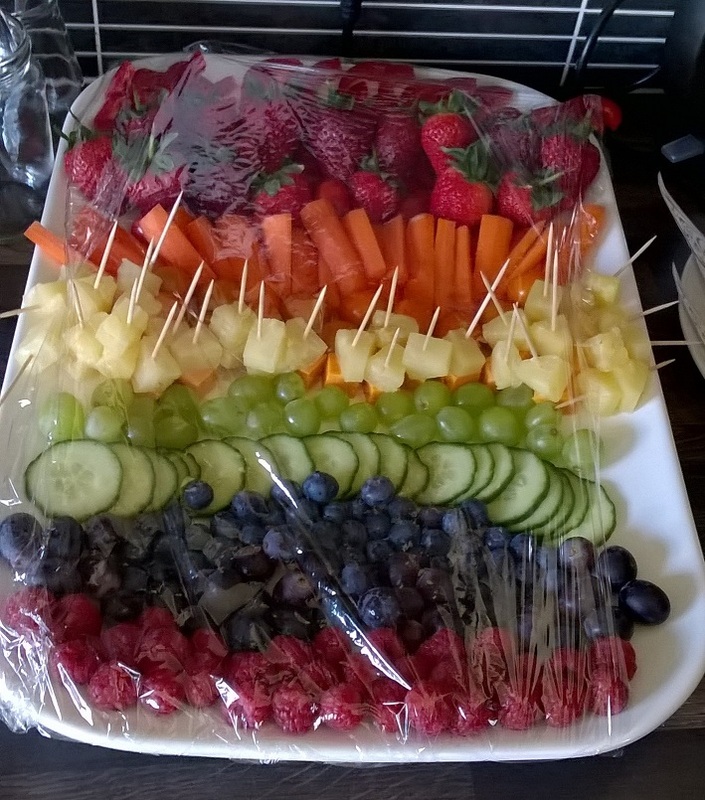 They’re really easy to make: just layer different coloured fruit and veg in their rainbow colours. Our birthdays are all in early Spring, so we don’t have that many brightly-coloured fruit and vegetables to choose from. Nevertheless, Mini’s plate this year contained strawberries and tomatoes, carrot sticks, cocktail sticks of pineapple and cheese chunks (we couldn’t find any yellow peppers or other yellow items at all! ), green grapes, cucumber slices, blueberries, black grapes and raspberries. Yes, that much fruit and veg doesn’t come cheap, but I promise you that it’ll all be eaten. So, what do I mean by ‘usual’ party food? 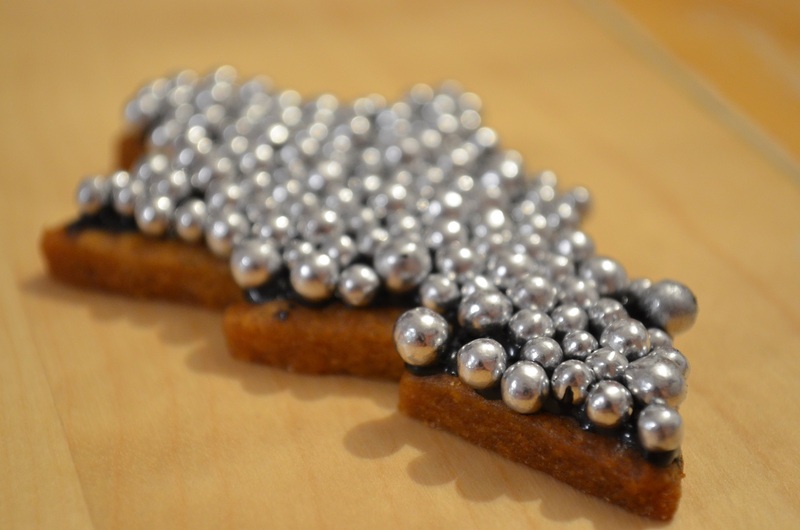 Lots of online Harry Potter-themed parties have plates of Golden Snitches because they are soooo easy. They also kept my 3 over-excited daughters occupied for 20 minutes making them! I printed the wing shapes that were a free printable from this blog post on a sheet of A4, then got 2 minxes to carefully cut them out whilst the 3rd minx stuck them on to the Ferrero Rocher sweets with a blob of PVA glue (removing and replacing the sticker dots was just too much of a faff when your party starts in half an hour) and stacked them on a plate. The Aftermath. So, first question: what was that cake like? Actually, even though I say so myself, it was delicious! By the time the sun set that day, we’d given away or eaten the entire cake. It was such a hit that I suspect it will feature in a fair few more of my 3 book-worms’ future birthday parties. Yes, OK, strictly speaking this is the 4th of 3 posts (!) detailing a quick, easy and really fun party that we threw for Mini Minx’s 7th birthday party. 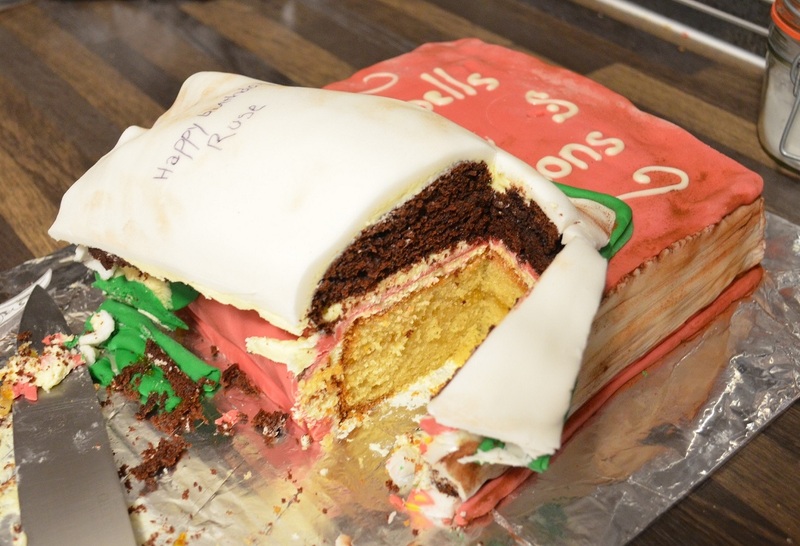 Well… 3 and a half: this is the birthday cake part of the post about the party food. I made the entire cake on the morning of the party. 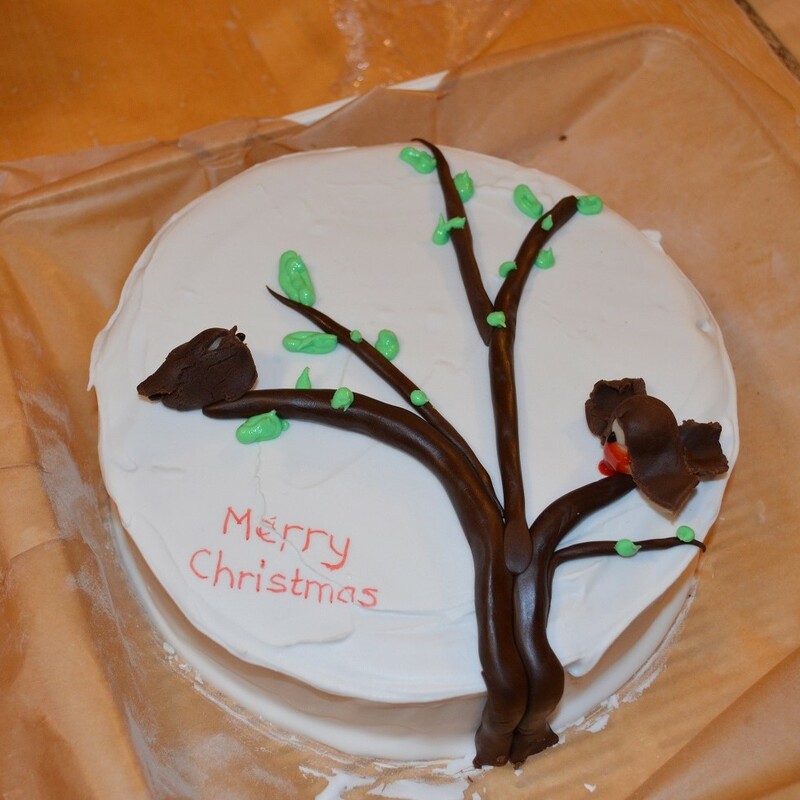 What with also supervising the prepping for the activities and helping with decorations, etc., I was very lucky that it all turned out ok, especially as I started making the cake without a real idea of how it would turn out. I really, really recommend that you do the cake the night before! 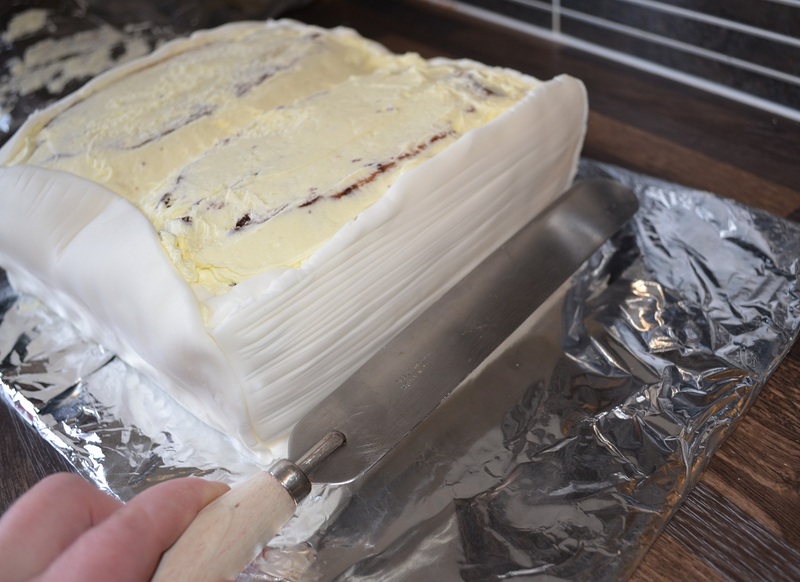 I’ve written this tutorial in case you’d like to do the same kind of cake and would prefer knowing at the start what the finished item will look like! I hope it helps. 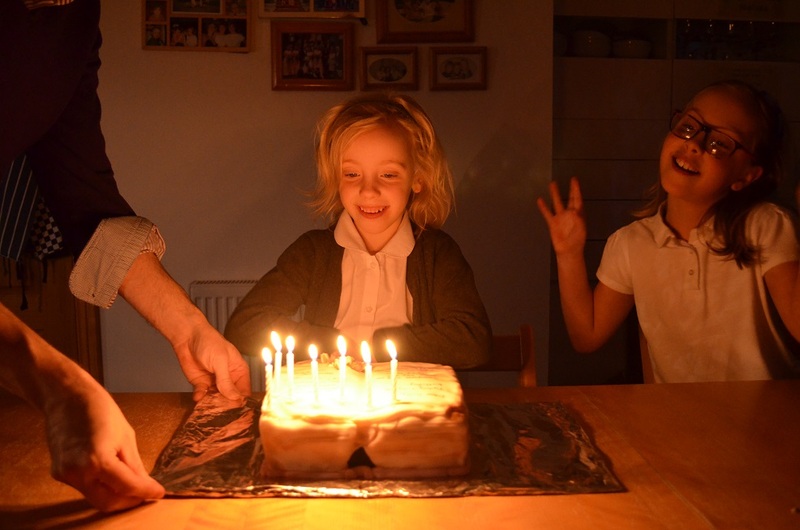 So, you really need to read how I put together her original birthday cake: the Hermione G ranger-themed cake because all the techniques and steps I used are described there. 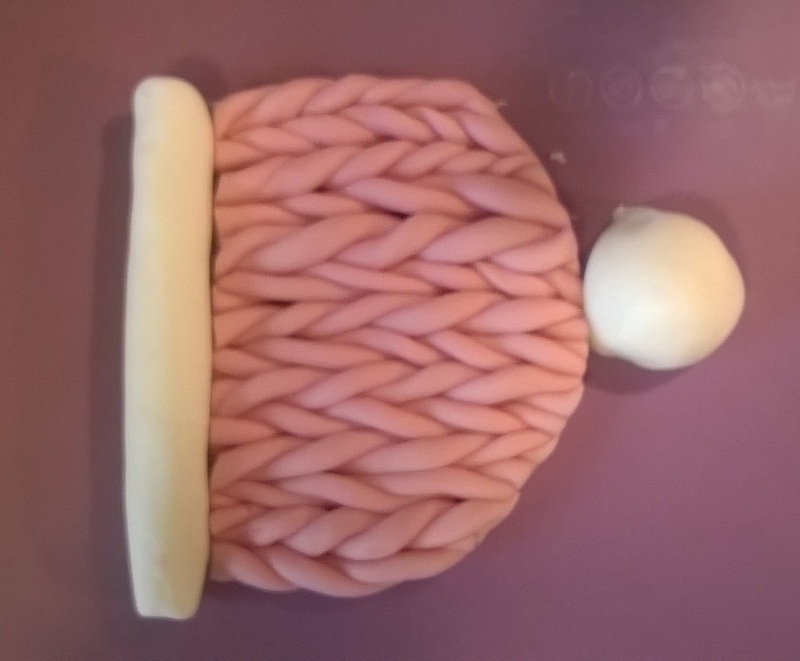 Follow Step 1 of the linked Hermione Granger-themed Cake post to make a big cake board. It needs to be big enough to hold a 23cm square cake and a loaf cake beside it, plus plenty of space all around. 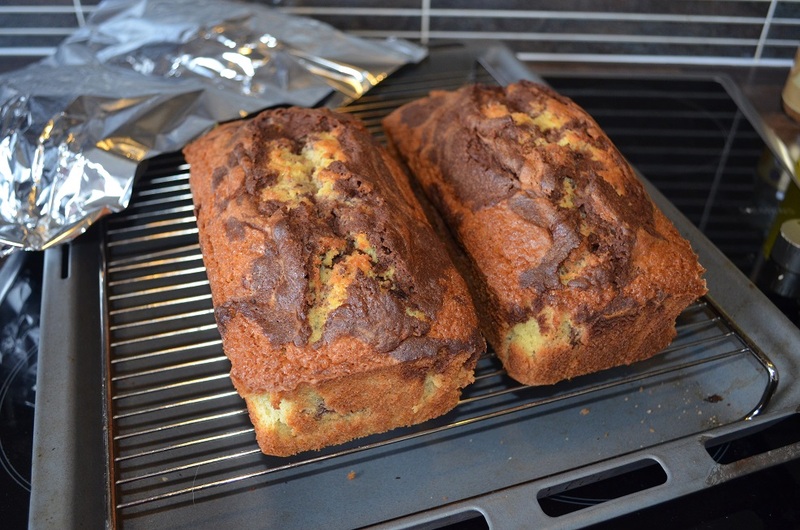 Instead of making 2 loaf cakes at Step 2, I made a big 6-egg square Madeira Cake and a plain chocolate loaf cake. I wanted cakes that had a bit of substance to them because I felt that basic sponge cakes would be too lightweight. a. Grease and line a 23cm square tin. Set the oven to 180degC / 350degF / gas 4.
b. Cream the butter and sugar until it’s really pale and fluffy. This takes longer than you think! About 5 mins in a mixer. Gradually add the eggs, still beating. c. Sift the flour and baking powder together, then fold into the creamed mix. Stir in the grated lemon rind. Spoon into the tin. a. Grease and flour a 23 x 13 x 7.5cm loaf tin. 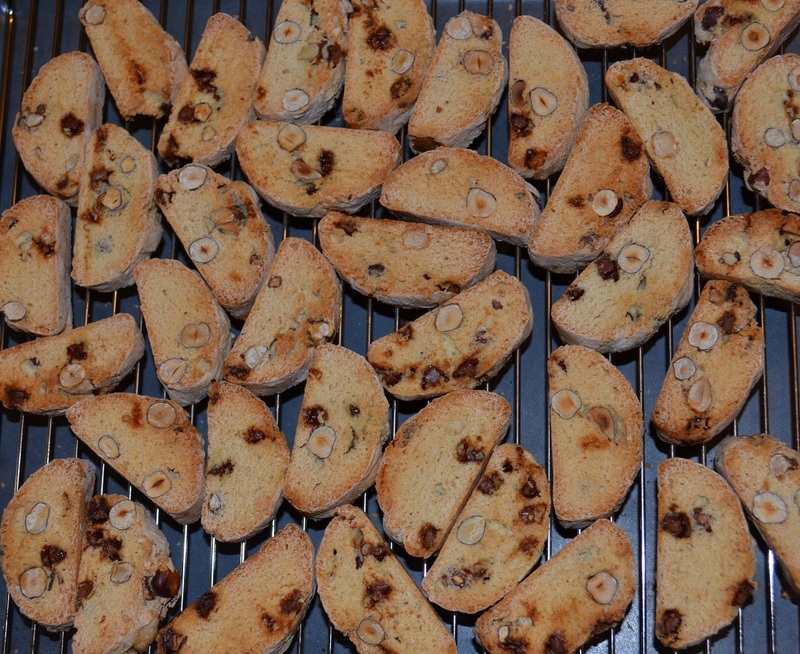 Set oven to 180degC/350degF/gas 4.
b. Sift the flour, cocoa, baking powder and bicarb together. Stir in the sugar. c. Beat the eggs into the melted butter and milk. Pour the wet mix into the dry mix and stir lightly. d. Spoon / pour into the tin and bake for about 45 – 55 mins till cooked through. Cool on a wire rack. Make up a double batch of buttercream using 2 blocks of unsalted butter (500g), 4 cups of icing sugar, and my all-time favourite method of making Whipped Buttercream Icing. a. Anchor the cake to the right-hand half of the cake board with a smear of whipped buttercream icing. Then slice it in half and spread a thick layer of apricot jam in the middle. b. Cover 3 sides of the cake with more whipped buttercream icing and use rolled-out white fondant icing and brushed cocoa to make ‘pages’ as per Steps 8-10 of the Hermione Cake tutorial. c. Cover the remaining side and top of the cake with whipped buttercream icing and place rolled-out coloured fondant icing over it to form a top cover and spine. 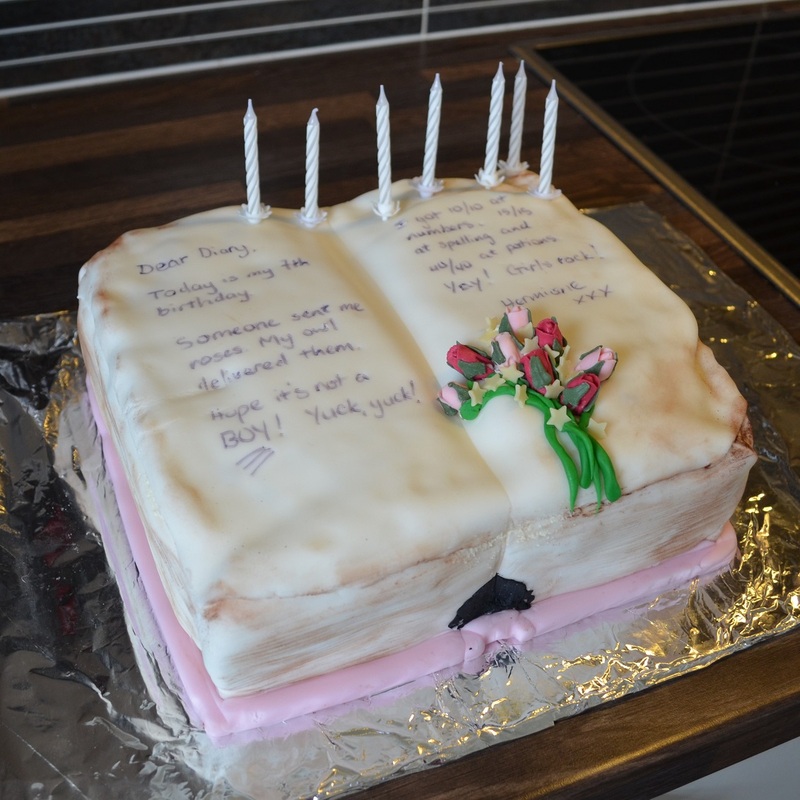 I used a mix of red and white fondant icing because I was running out… Roll out a long sausage of more coloured fondant icing and place along the bottom edge of the white ‘pages’ to look like the bottom cover of the book showing, as per Step 11. See the spine detail and the bound pages fanning away from the spine cover of the pink book? I bet you can do a far better job than that! I was really stressing about the time at that stage. d. Decorate the spine with fake gold lines and details (yellow fondant icing) if you like or just leave blank, as you’ll barely see it. I also pressed in the cake a little between the pages and spine to make it look like bound pages curving away from the spine, and ‘shaded’ it with yet more cocoa. See how the 3 layers of the chocolate loaf are placed? I was inspired by how the chocolate loaf top puffed up and out as it baked – it looks like the shape of partly-fanned out pages for the chocolate ‘book’. (Well, it did to me). a. 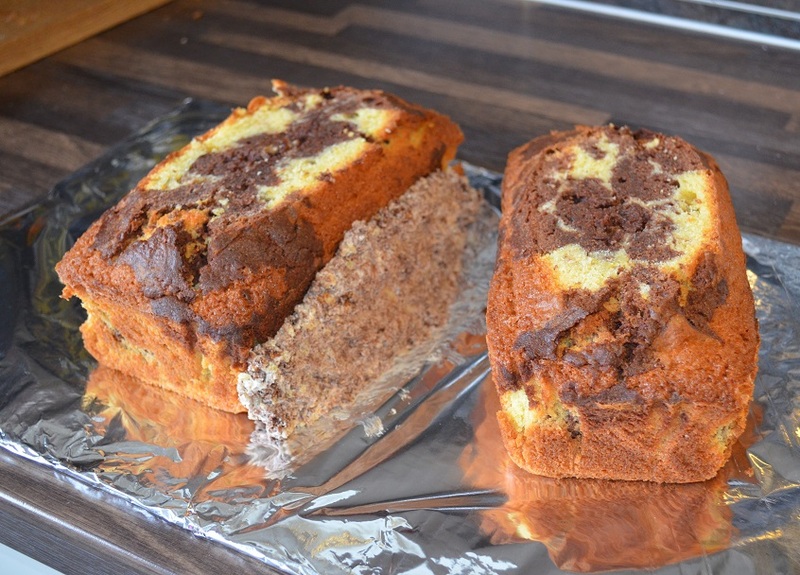 Split the plain chocolate loaf into 3 slices. Sandwich the bottom 2 layers with more apricot jam and whipped buttercream icing and put them beside the Madeira cake. b. 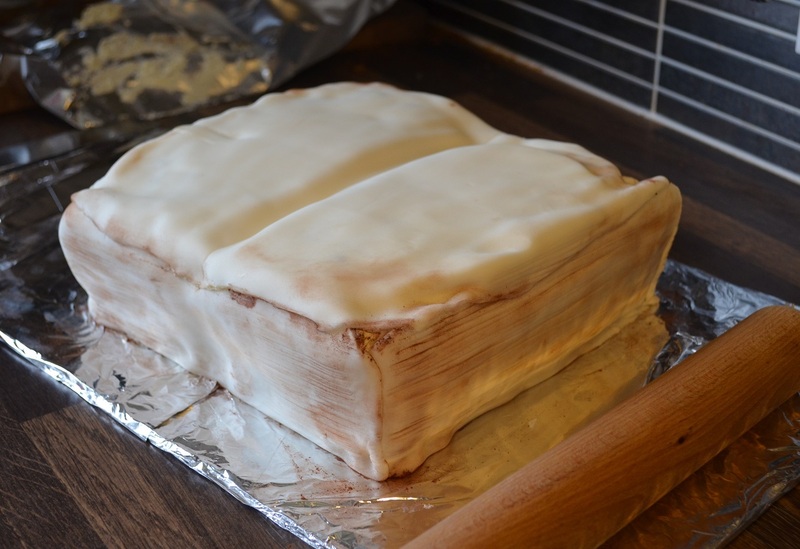 Place the top layer on the Madeira Cake to look a bit like the open pages of the chocolate book – see photo for positioning. When you’re happy with the look, use a smear of buttercream to anchor the sandwiched layers beside the madeira ‘book’ and use a good thick layer of whipped buttercream to hold the top chocolate layer in place. Eat! It was a good cake for slicing up and putting in party bags, and the mix of plain and chocolate sponge looked great. It was completely gone within 24 hours (we Greedy Trouts had 2 slices each), so I’d say it was the perfect size for a party of 10 kids. 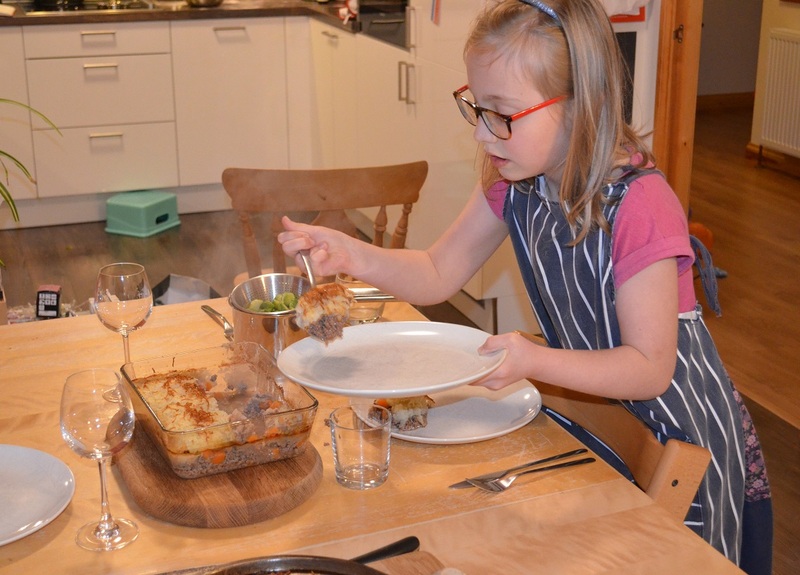 The youngest children in all families are inevitably influenced by their older siblings, and Mini is no different. She learned to read better so that she could read her sisters’ favourite Harry Potter books. She’s such a huge fan that I am now the only one in the house who’s never read them, nor am mad-keen on everything Harry Potter. 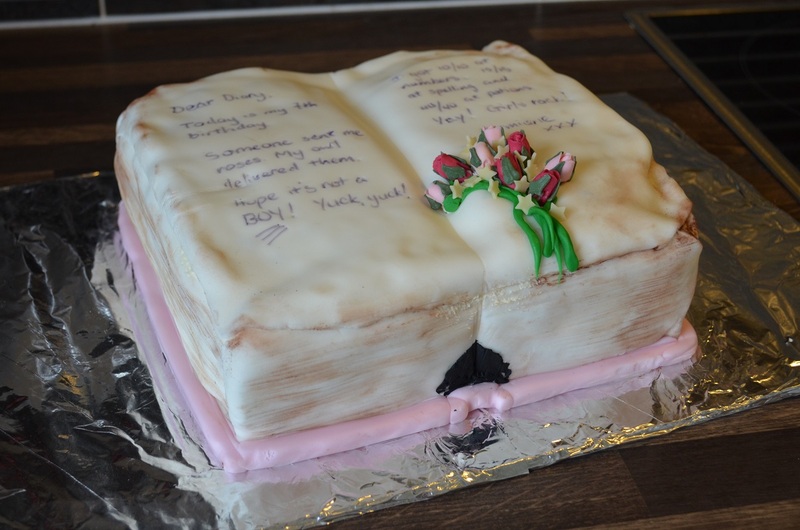 I decided to do a fairly simple book cake, and call it Hermione Granger’s Diary. I took photos of the process so that I’d remember it for her more complex birthday party cake later that week. And as a bonus, I can use them as a tutorial to show you how easy it was. 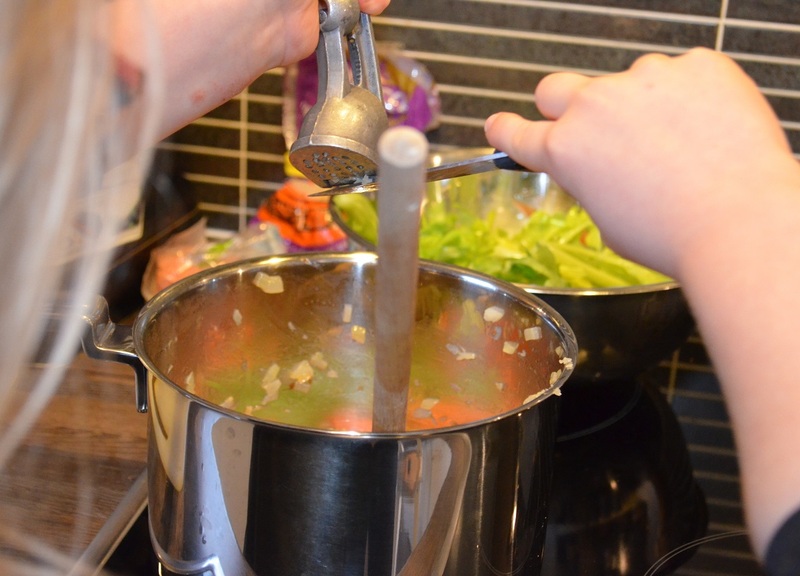 Remember, I’m not a great cook or a talented cake decorator – if you take your time and follow my top tips, you’ll produce something far, far better. Please share your own hints and tips too! OK, start the day before by baking the cakes and preparing a cake board. Don’t bother buying a board. 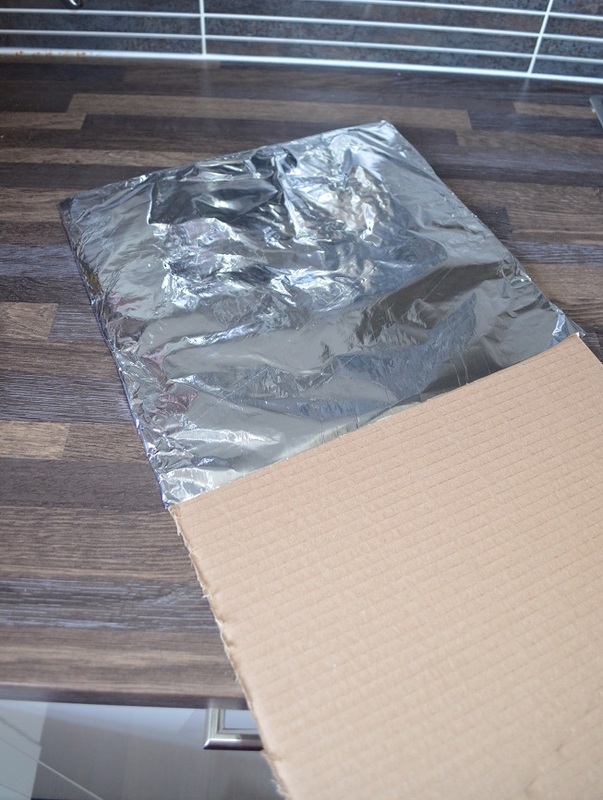 Just get some stiff cardboard (I cut a bit off a packaging box, but have been known to use a couple of empty cereal boxes) and cover it entirely in tin foil. This makes it look good, gives you something big enough to work on, makes the cake portable, and it’s also easy to wipe crumbs and smears off the side. Make 2 loaf-cakes and let them cool completely. 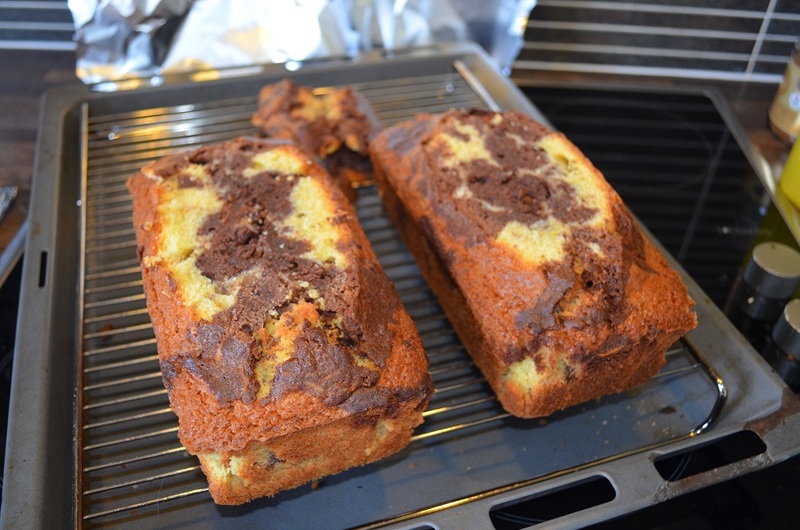 Maxi suggested I make them both chocolate and orange marble cakes and so I used double the recipe at the link. I didn’t ice them with the drizzled chocolate and I didn’t use food colouring. Make up a batch of plain buttercream. I used a block of unsalted butter (250g), 2 cups of icing sugar, and my all-time favourite method of making Whipped Buttercream Icing. Using a sharp knife, cut the top off the loaves on a bit of a slant. 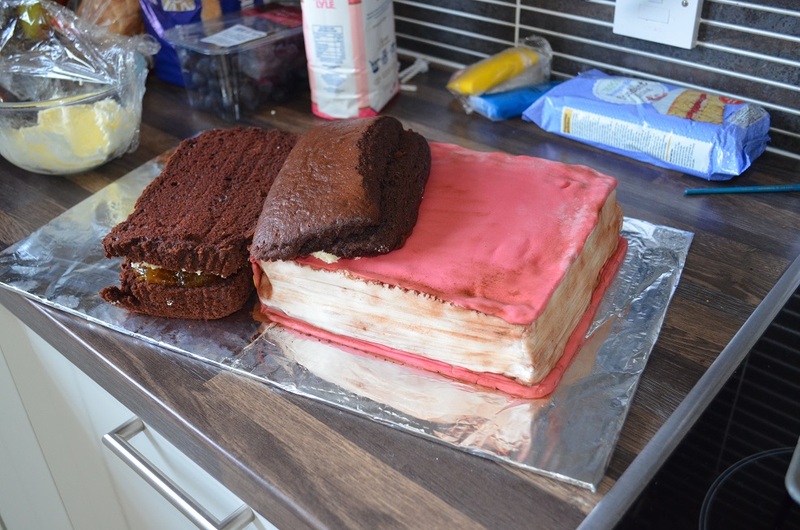 This shapes the cakes so that they’ll look a bit like an open book when you press them together. If you were neater than me, you would cut the tops off entirely so that there are no curved edges. If you’re worried about the cakes becoming too thin, you could raise them up by slicing each loaf in 2 and filling with jam and/or cream at this point. In the interests of thrift, crumble the bits of cake you sliced off and mush them together with a spoon or 2 of buttercream. Effectively you’re making a batch of cake pops, but you’ll use it like mortar to hold the 2 loaf-cakes together. Put a smear of buttercream on your cake board and place a loaf cake on top (this will hold it down). Squish the cake-pops mortar along the side of the cake, then smear more buttercream on the board and stick the second loaf-cake to the first. Really squish the cakes together. Now cover both cakes in the rest of the buttercream. Don’t worry about getting crumbs in the icing: it really doesn’t matter because it’ll all be covered in fondant icing. Roll out some white fondant or ready-roll icing to form the pages along the sides of the cake. 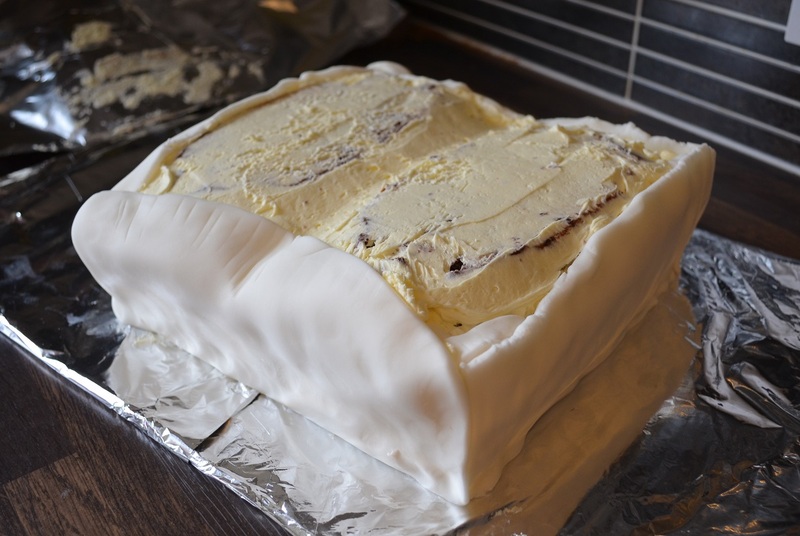 I used a 500g block in grand total, but you might need more or less: it depends how thinly you roll the icing. You could be extremely neat and cut them into beautiful rectangles, or you can be slap-dash like me and just wodge them on. 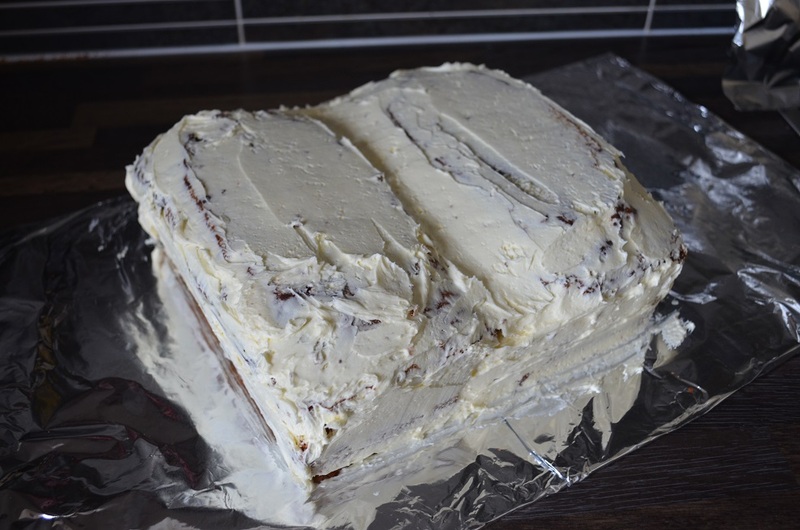 I used the excess fondant icing to start to disguise the misshapen bits of loaf-cake, but as I said in (4) above, you could avoid that by slicing the tops neatly and more severely. 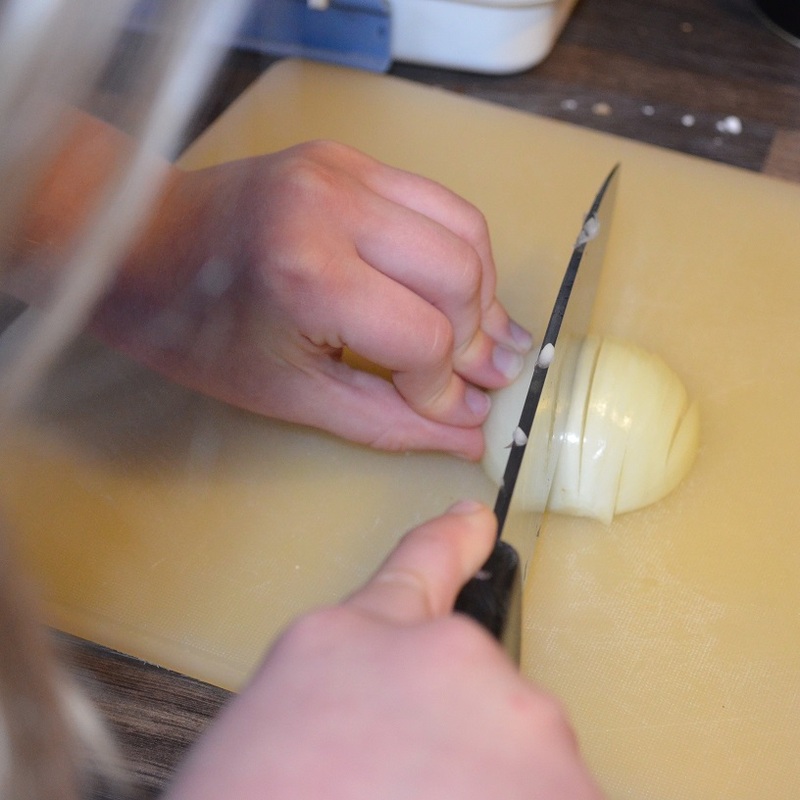 Use a blunt edge (spatula, back of a long knife, etc.) along each side to make lots of page marks. The layer of buttercream under the fondant icing will help. 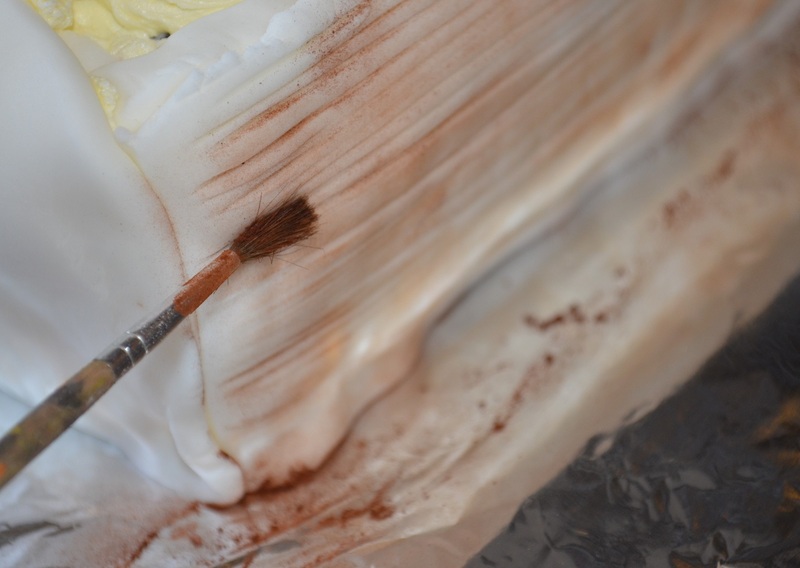 Dip a clean paint brush in some cocoa and use it to brush the edges of the pages to make them look old and dirty. I’m not sure that Hermione’s diary would actually be so grubby, to be fair, but I wanted to try out the technique. Roll out more white icing and place over the top of the cake. Shape it with your hands so that it looks like an open page. Brush more cocoa along the edges and on the ‘pages’. 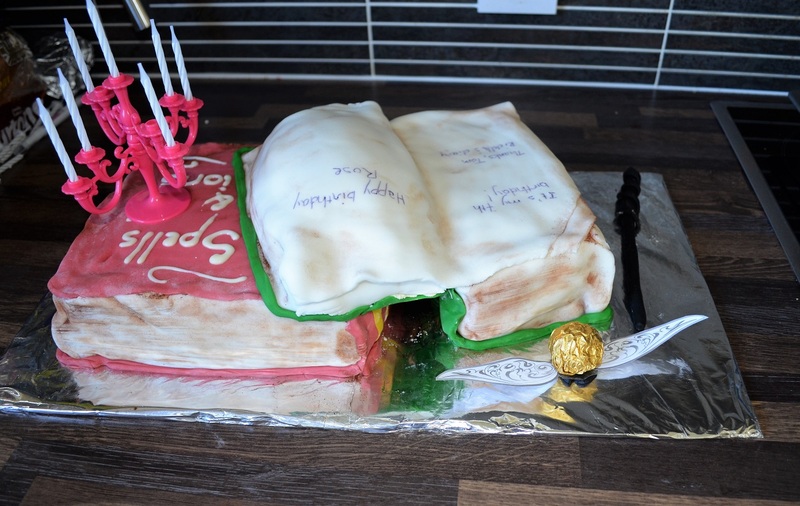 Roll some coloured fondant icing (or colour the last of the white fondant icing with some food colouring) into long thin sausage shapes and place them around the edges to look like the book’s cover, peeping out from under the pages. Flatten the sausages with a flat edge on top and at the side. If you have any black icing, add a little arch in the middle of the front and back to look a bit like the empty space where the edges of the pages curve away from the book binding. (Or just brush lots of cocoa in that corner to achieve the same / a better effect). Decorate! I used a pen that writes on icing to write something, and made a bit of a bouquet of roses with a tiny bit of green fondant icing I had leftover from The Boss’s birthday cake last month and some shop-bought icing flowers. I shook some little white chocolate stars over the top to use them up (they’ve been lurking in my cupboard for too many years… I swear they’re breeding…). Add some candles and go! Why you use a cake board! Every year, starting around the end of October, my kitchen smells of Christmas cake. I bake 4 big ones, cut them up into different sized cakes, ice and decorate them, let them dry out, then send them off to brave the Royal Mail to reach relatives. So at any one time in November and early December you’ll find a glass dish full of dried fruit steeping in brandy, foiled-wrapped cakes occasionally being ‘fed’ with more brandy, and chopping boards laden with little cakes in various stages of sugar-covering, all hiding underneath a protective ceiling of foil. Oooooo, the smell is delicious! 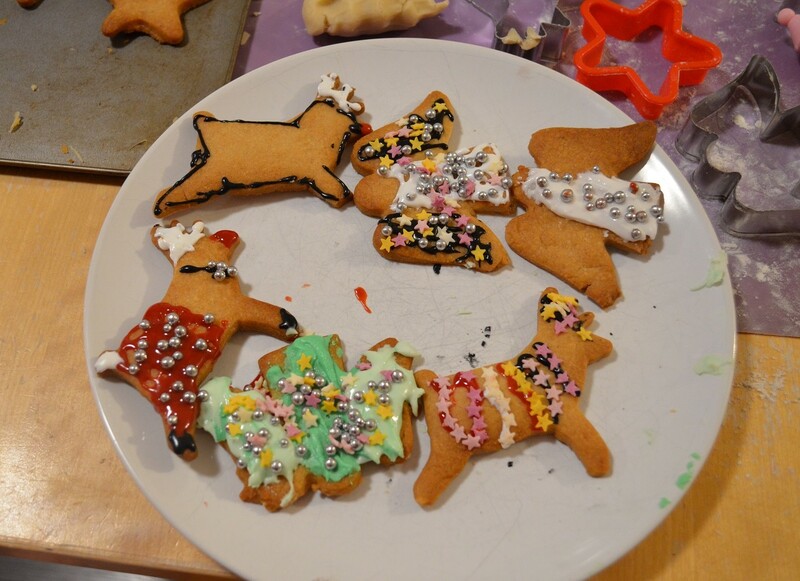 This year, though, I had the foresight to look through Pinterest for ideas before I got out the marzipan. I thought I’d share my take on the ideas with you and tips on how I did them in case you’re tearing your hair out icing 9 cakes, too. 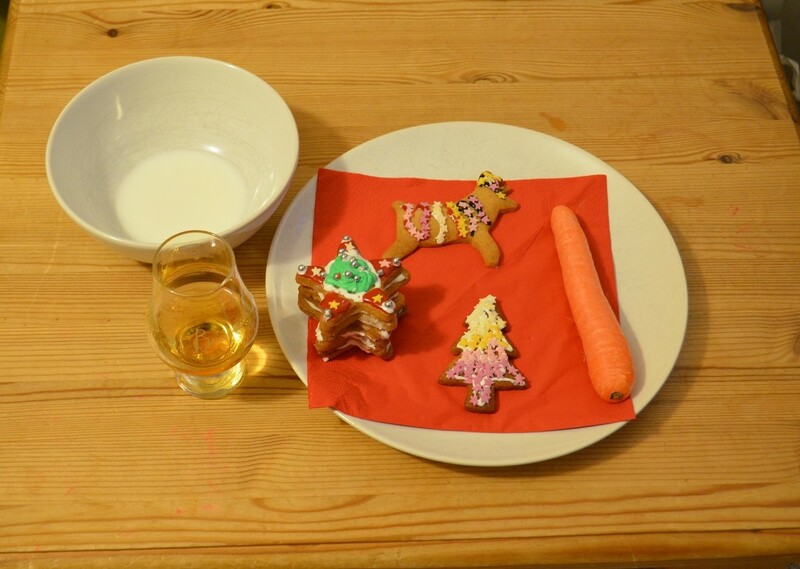 Start with your fruit cake iced already. I put a layer of marzipan and a layer of ready-to-roll icing on top of mine because I wanted to be able to smooth out the edges. If I had time (and the skills!) I’d have applied a layer of royal icing and left it to dry. The knitted hat decoration is just coloured fondant icing. You can make your own or buy it ready-coloured and ready to roll. Knead the coloured icing really well until it’s soft and pliable. Take 2 golf-ball sized chunks of it and roll them into long sausages. Twist them together into a long twirl. Take another 2 chunks of icing and repeat, except this time twist the sausages in the other direction. Lay the 2 twirls side by side, on a piece of baking parchment or a silicone mat. Pat them up close together until the twists match up. 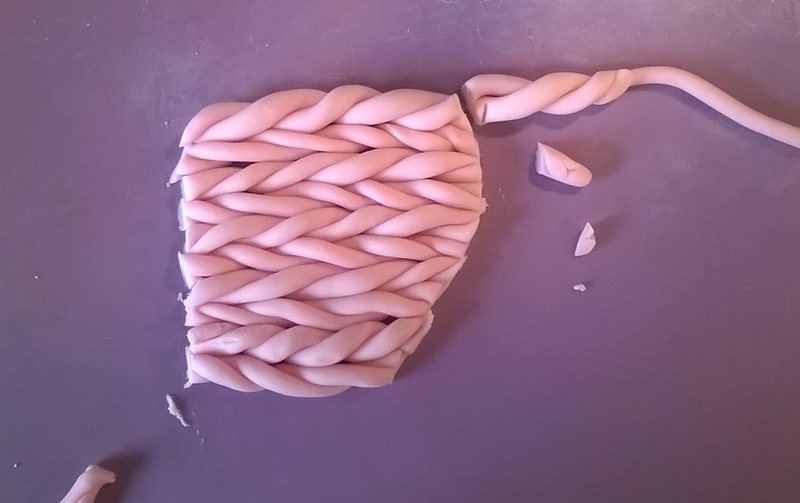 Cut the pairs of twists to the length you want, then lay the off-cuts alongside. Cut a hat-shape out of the twists. Take some white fondant icing and form it into a fat sausage, which will become the brim, and a round ball, which will become the pompom. Cut the ball in half so that you have a nice flat surface to stick to the cake. 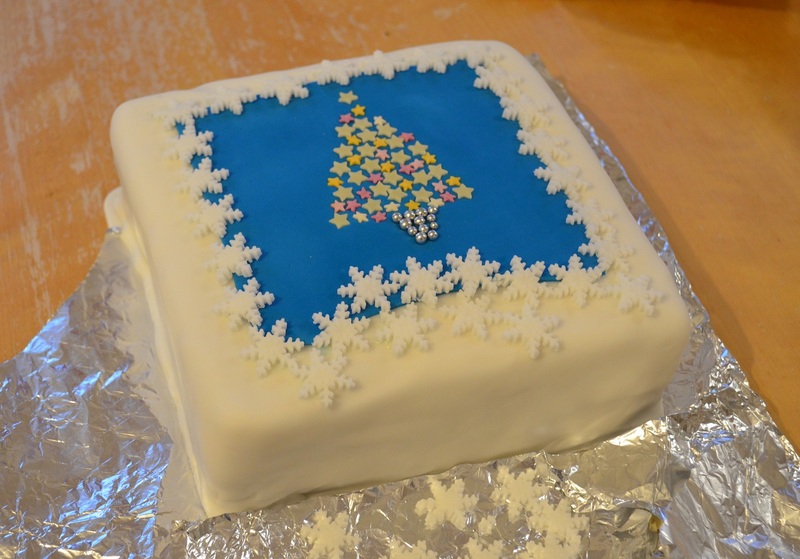 Finally, I added a little fondant icing snowflake I’d stamped out. Do this at the last minute so that it’s pliable – if you leave the snowflakes to dry out, they’ll crumble when you press them into the hat. Leave the icing to harden for a few days before you try to post the cake. Again, start with a fruit cake that’s already iced. 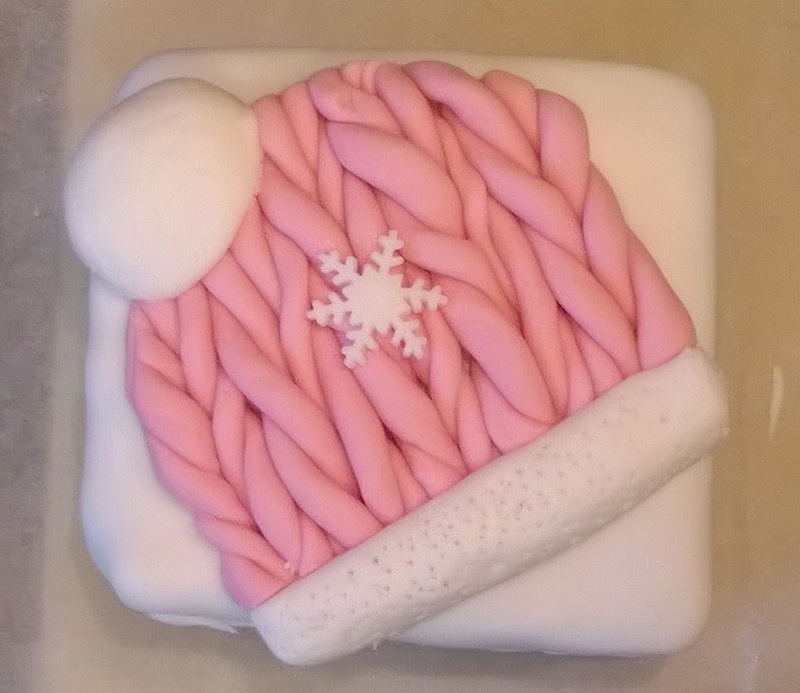 I used a layer of marzipan and a layer of white ready-to-roll icing, the same as the knitted hat cake above. 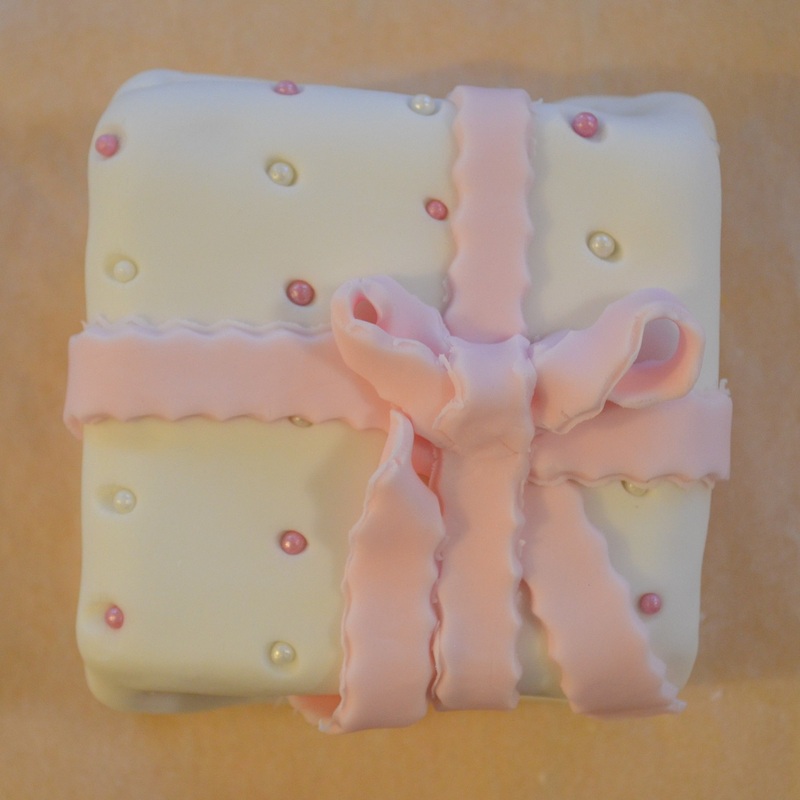 Take a good chunk of coloured fondant icing and knead it until it’s very pliable and soft. Roll it out till it’s around 5mm thick. Cut it to size and shape. 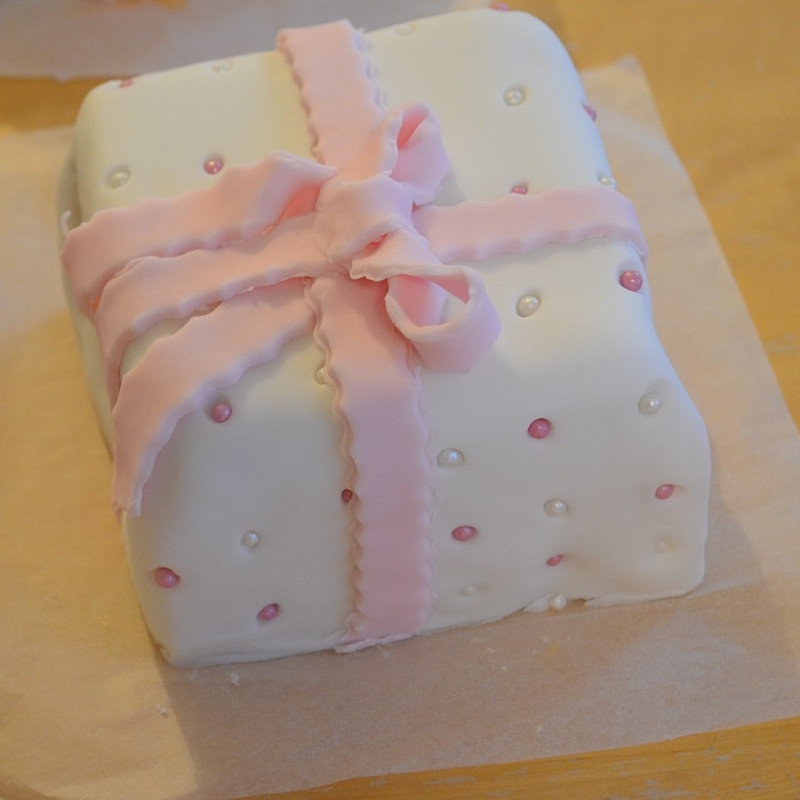 Lightly moisten the white icing with some cooled, boiled water, then place the coloured icing on top (My blue icing was originally a beautiful square, but I have to tell you that I was a bit slapdash about taking it off the rolling mat and putting it on the cake – it stretched. 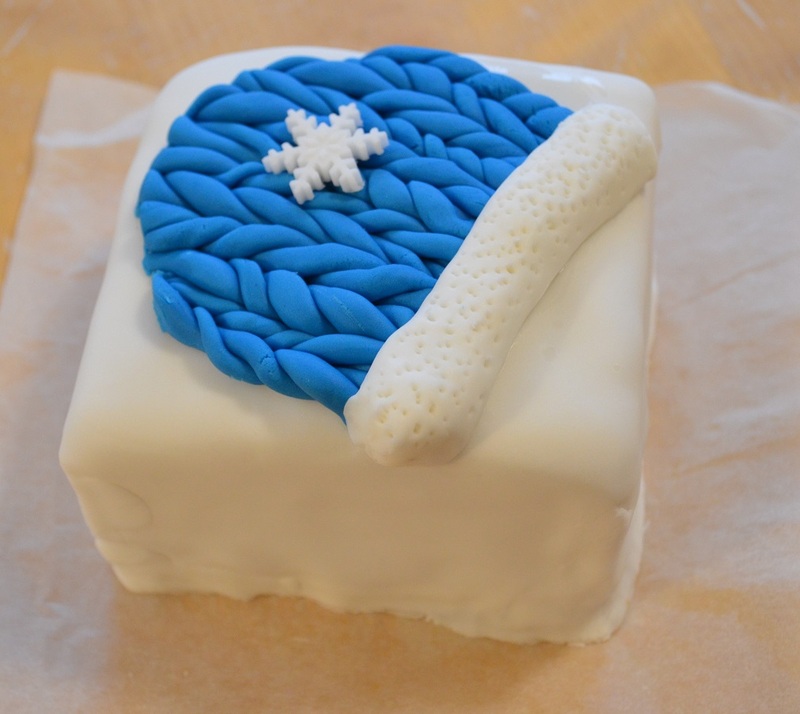 I’d no more blue icing and it stuck a bit too well to the white icing, so I just left it and covered up the wonky edges with snowflakes). Now gently scatter whatever decorations you want on top. 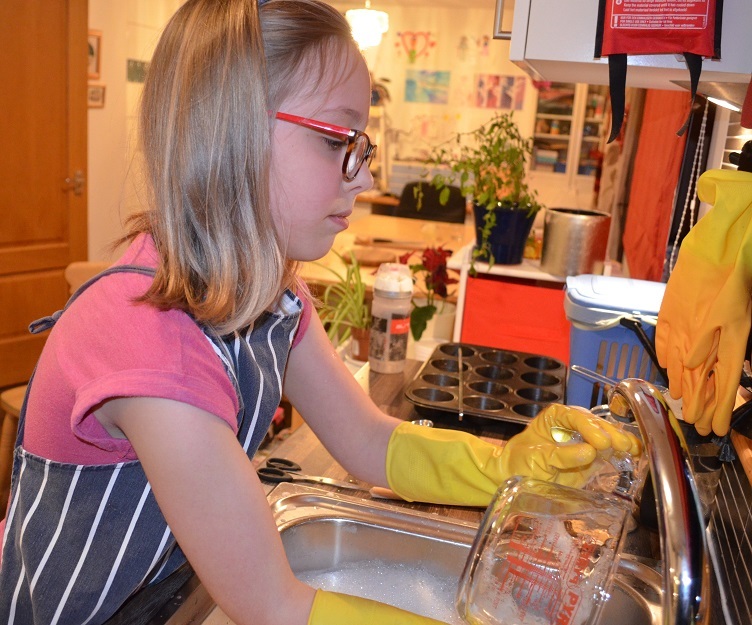 Get them into the places you like, using cold clean fingers (!) or the end of a paintbrush or even tweezers, then gently press them into the coloured icing. 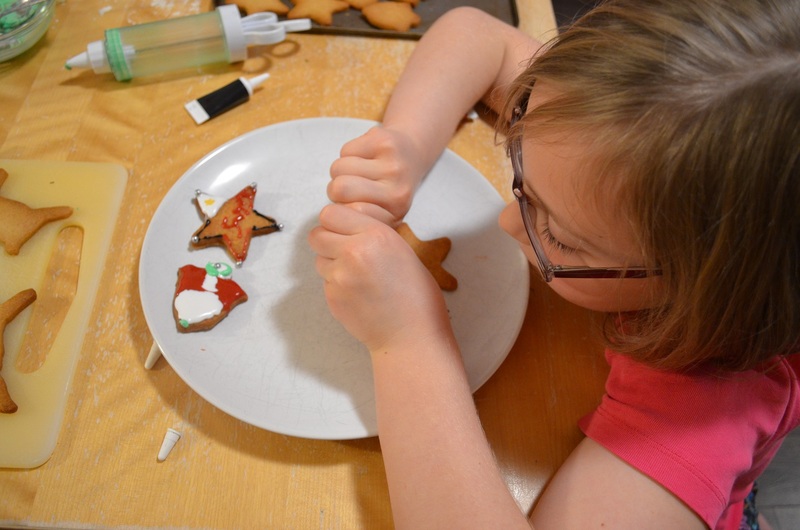 When they’re pretty well secured, use a rolling pin to gently roll over the top into a more level layer and press the decorations in even more. I used tiny white chocolate stars and some sugar stars in my Christmas tree. 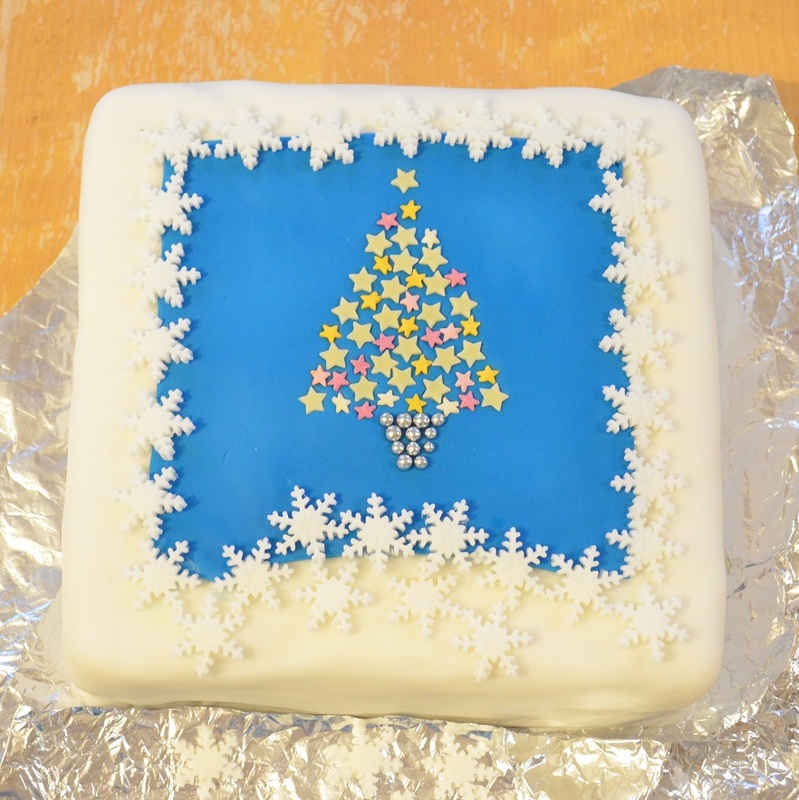 Cover the edges of the coloured icing with whatever you have to hand – I stamped out some snowflakes from more of the white fondant icing. If I’d had more time, some silver balls would have looked great, or best of all, some piped swirls. Aye, maybe next year! I think the present cake is easiest of all. There are so many beautiful pictures all over Pinterest, and this one inspired me. I covered a fruit cake with a layer of marzipan and let it dry. Then I rolled out some white fondant ready to roll icing, brushed the marzipan with cooled, boiled water and placed the icing on top. I smoothed the top and bottom edges in tightly to the cake. Then I folded the side edges in like I would with wrapping paper. 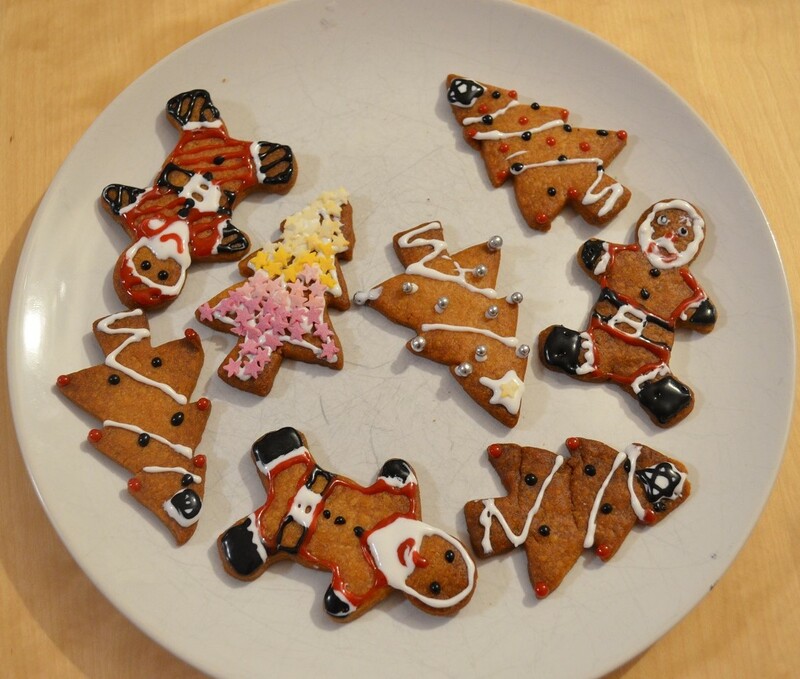 What an easy way to finish off the icing – no smoothing or cutting! I gently pressed in lots of little sugar balls. In hindsight I think it would have looked better with a random pattern, and making a pattern took a lot of time. But hey-ho! 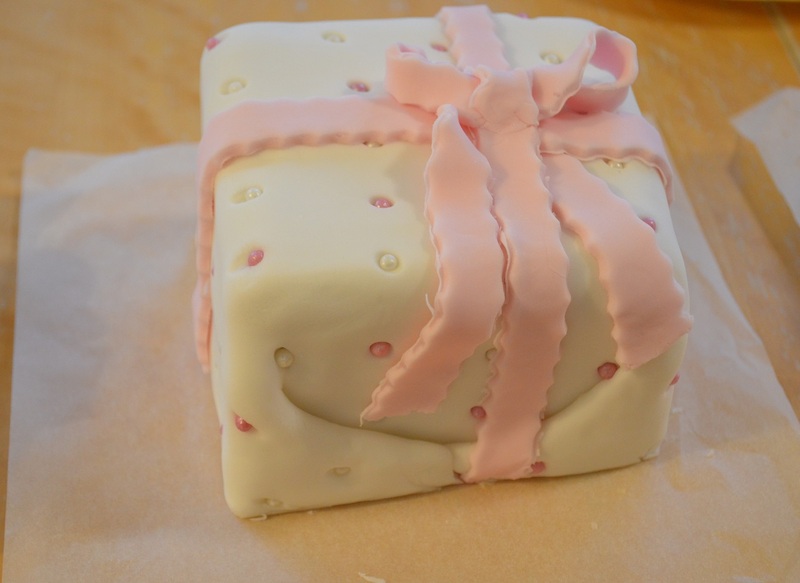 I took a big chunk of pink fondant icing and kneaded it till it was soft and pliable. I rolled it out, then used a pastry cutter to cut it into strips. I brushed each strip with water, then stuck them to the top of the cake in a cross shape. I made a bow out of some strips and stuck that to the top. Again, I left the icing to harden for a few days before trusting the cake to the Royal Mail. I’ve yet to ice our own family Christmas cake. I think I’ll leave that one for the minxes to do! 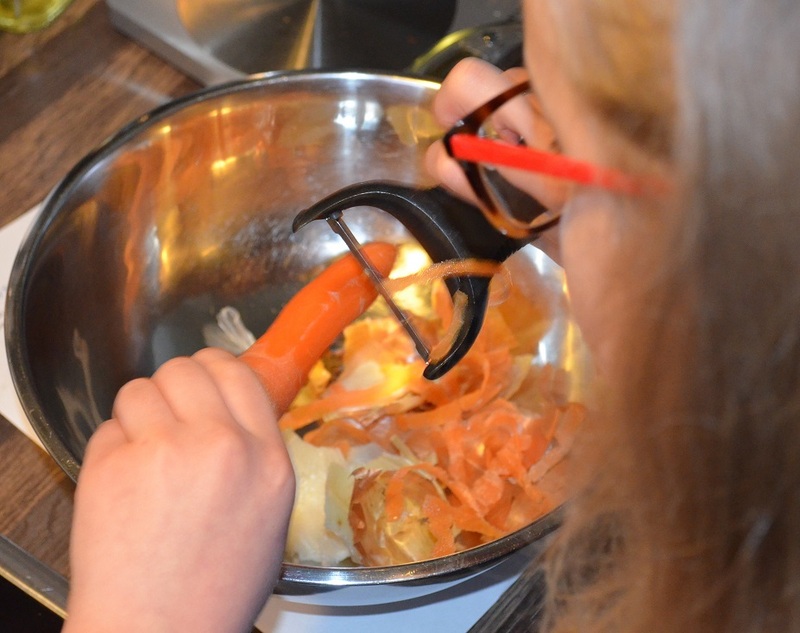 Well, I don’t know if it’s better, but the version I’ve come up with is certainly very easy and tastes even better the day after it’s made – bonus! If you adapt this yourself, why not comment below and share your top tips with us all? I’m ready to take notes. 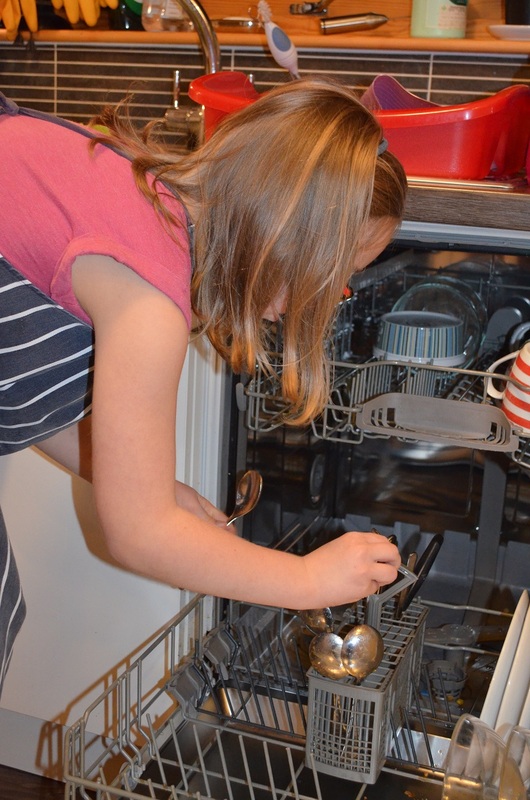 Preheat the oven to 210degC (gas 7) and take out your mince-pie tins. Clear space in your fridge to precariously balance the tins on. 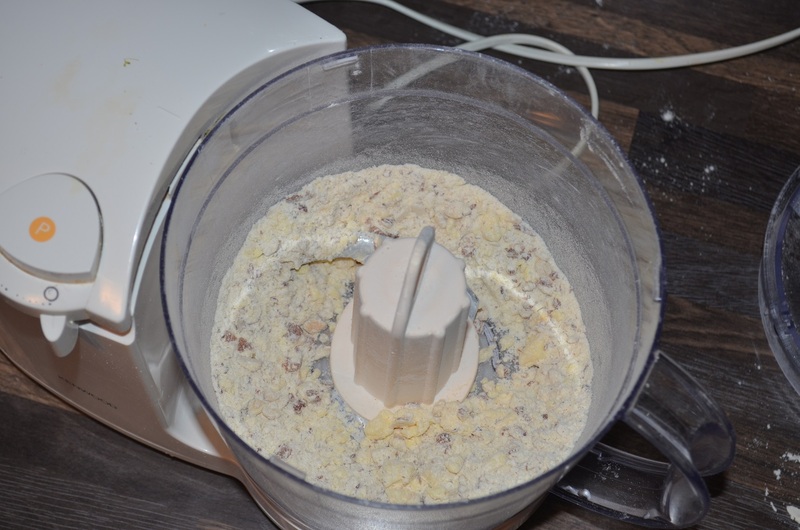 In a food processor (with the whirly double blade), whizz up 180g plain flour with 90g cold butter. When it’s the consistency of breadcrumbs, add icy cold water and lemon juice a tablespoon at a time, pulsing the processor. You’ll only need 2-3 tablespoons. Stop just as the dough is coming together. Roll and cut out the base of the mince-pies (ie make pie cases). I managed 18 with this amount of dough, but it depends how thinly you roll it – you might make more or fewer. Line the mince-pie tins with the pie cases and put in the fridge. 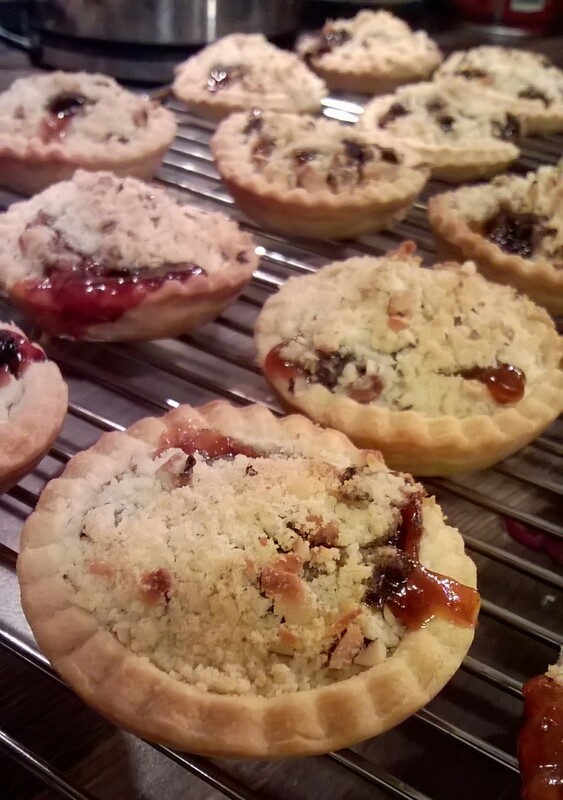 When the oven’s at temperature, take the mince-pies out the fridge and add a teaspoon of mincemeat into each pie-case. Spoon the crumble over the top. 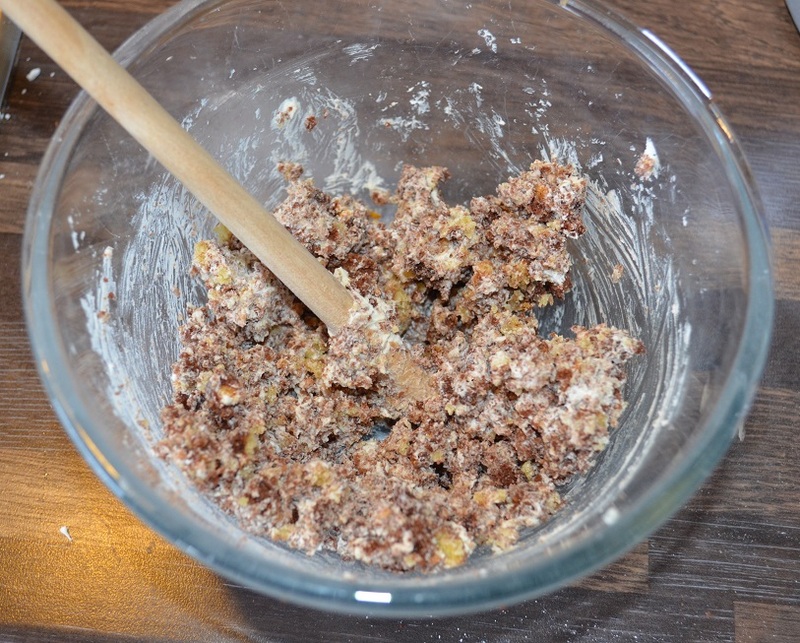 For me, it worked out about a tablespoon of crumble mix per pie, but it all depends on how many nuts you added. Bake for 15 – 20 mins. Remove to a wire rack immediately because any spilled mince-pie mix will cool to concrete, cementing your pies to the tin forever. Eat alone, with a cuppa, slathered in custard, or drowned in cream. Ah. It seems I never got around to finishing a post last year about the cake I baked for The Boss’s birthday. Well, I did the same one this year: a Prinsesstarta. It was one of the technical challenges on Great British Bake Off a couple of years ago and made a big impression on The Boss. Every year we bake each other a birthday cake; every year I ask for super-lemony drizzle cake and every year he goes for Dundee cake. Till last year. Cackling a little too loudly, he asked for a Prinsesstarta. Well, I’d seen it made on GBBO and had a detailed recipe. How hard could it be…? See, it’s almost out the door! Chuffing hard when you’ve never made a whisked genoise sponge cake or creme patisserie before… After spending all day on the bloody thing, my 2015 attempt virtually ran out the fridge (and out of the kitchen and down the street). The Boss chortled at the mess I managed to hold together with lots of marzipan, which made it lumpy and a bit like Yoda’s face, but declared the taste delicious. what a cake – I bow to their superior skills! 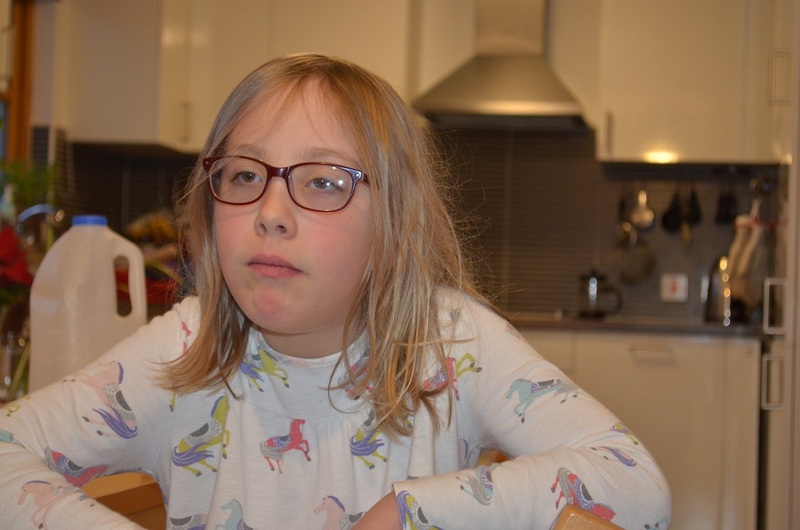 This year he asked for another Prinsesstarta. I told him to take a running jump: he was going to get a Dundee cake as usual. Secretly, though, I spent 2 whole days trying hard not to cough over it, doing a bit, lying down for a rest, then doing some more. Sod the 2 and half hours limit of GBBO! I’m strictly amateur. I made the creme pat extremely thick by cooking it for waaaaay longer than the recipe said, over a lower heat. I didn’t overwhip the cream this year. The sponge rose beautifully like a souffle because… well, I’ve no idea. Just luck this time. And because I made it in a narrower tin (8″), it was thick enough to cut into decent layers. Finally, I had leftover jam from when we foraged all those wild raspberries last year. 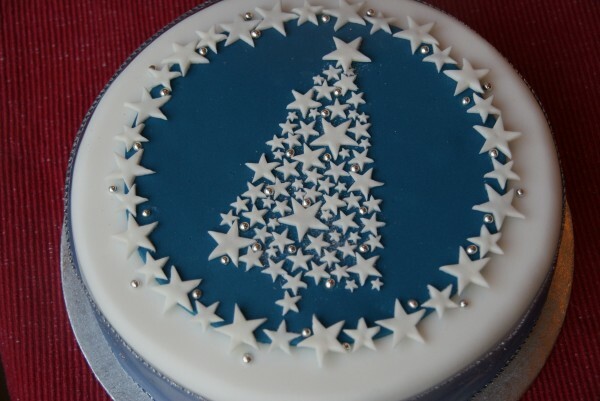 It was an overly-tall cake, but oh my stars, it was delicious! Worth the effort for the taste alone, never mind the happy look on The Boss’s wee face when he saw it. Still, life is too short to make another ever, ever again, that IS for sure! Nice rose this year, rubbish chocolate decoration. But who cares? It’s edible! So. I’m really not in the mood for any nonsense, or much of anything at all. They won’t watch tv or DVDs without bickering over the channel or the volume. They won’t read their enormous stack of library books. They won’t play together, whether nicely or not. All they want to do is scatter Lego over every square inch of carpet or floor, and torment each other in a competition to see who can make Maxi howl or Mini screech the loudest. I tried distracting them with a bit of compost, some seeds and baby spider plants that need potted. But that involved going out to the garage for 28 seconds. After about 23 seconds, Mini raced out the house screaming about Maxi, Maxi was trying to drown her out with her own complaints, and Midi was just chanting something incoherent, just for the sheer hell of it. Eventually I needed cake. Either that, or my bleeding ears were going to make me abandon them to a feral life of eating cat kibble from Killer Cat’s bowl and making a living selling popping candy and sherbet dip-dabs. 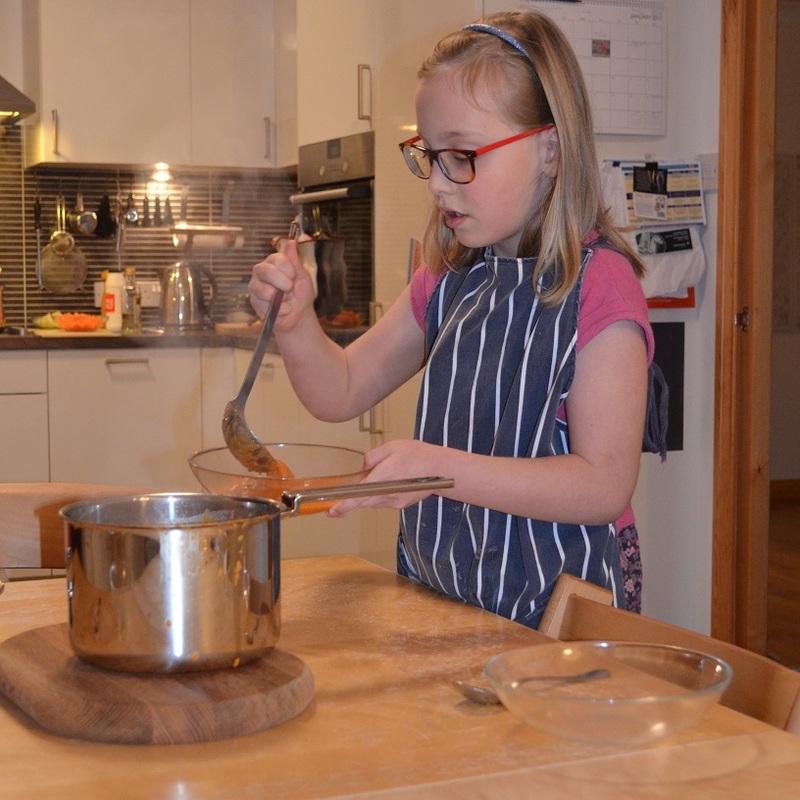 I had a cunning plan: Midi loves baking. I think it’s because she gets to use sharp knives. 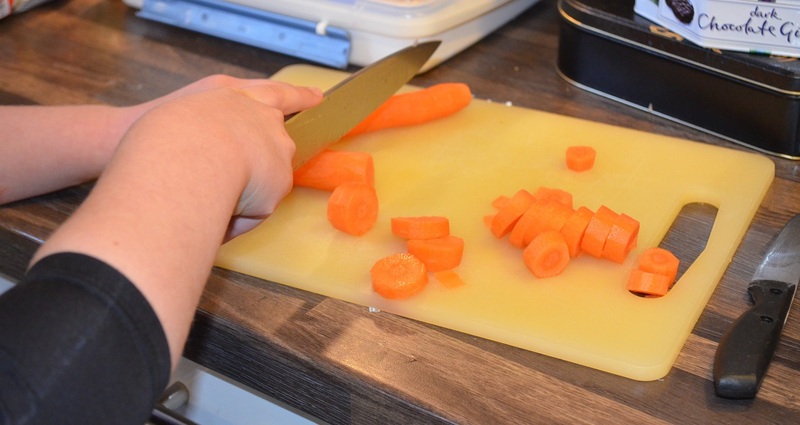 That child will choose the huge meat cleaver to delicately slice off a bit of butter to mix with sugar. 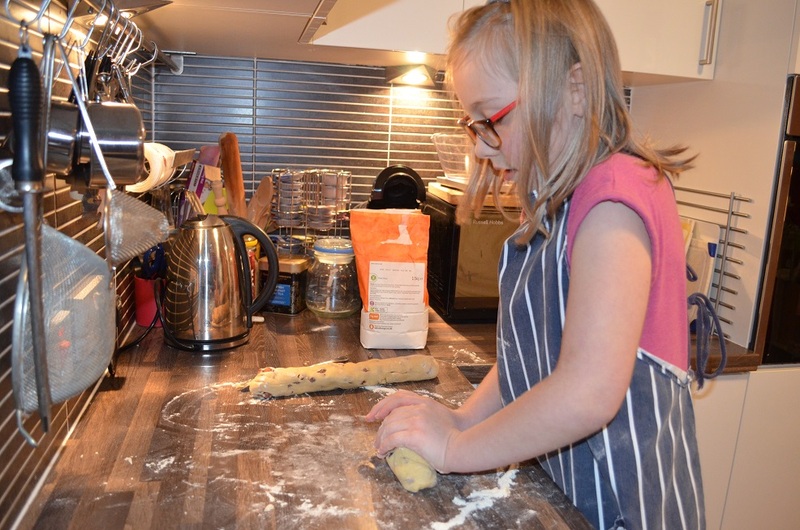 Anyway, I dragged her (literally) off her elder sister to come and ‘bake with Mummy’. Silence reigned briefly until Mini and Maxi happily agreed on some music for the CD player (Justin Bieber. Dear God, have my ears not suffered enough?!). 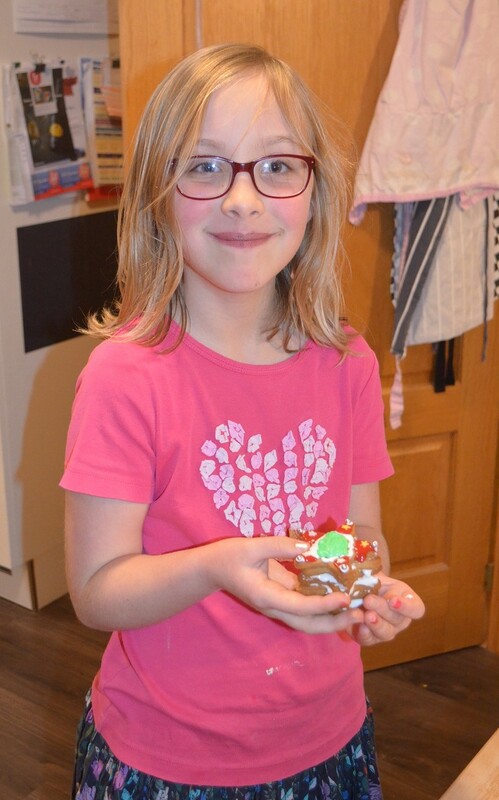 It didn’t take much persuading for Midi to merrily take over the baking – The Glasgow Cookery Book’s coffee buns, so-called because you eat them with coffee, not because there’s any coffee in them – and give me time to actually have a coffee while she made them entirely herself. There was a 10 minute period of total silence while the girls troughed the buns, then it was back to the shrieking and whooping onslaught. Last time I checked on them they were jumping off tables and setting up rope ladders in the pitch dark, screaming about air ambulances rescuing injured rich skiers in a power cut. Surrounded by aliens.